Where Am I Building My Life? My Dad was very talented when it came to creating things. He created everything from beautiful, fine crafted wood workings that were gifts from our government to others and celebrated in city parades, to houses, and everything in between. I was so blessed to grow up on building sites and in work shops where my Dad would share his wisdom with me as he worked. One thing my Dad taught me was that wise builders know that every house must have a foundation. A foundation is usually made of concrete or stone and steel, and its purpose is to hold the house up from underneath. Wise builders also know that the foundation must be built on very solid ground or rock. If the house is built on sand, the building will fall when the sand under the foundation washes away in a storm, or when it shifts during an earthquake. Who’s sending missionaries to that country? Who’s planting churches there? That’s a HUGE mission field waiting for us. 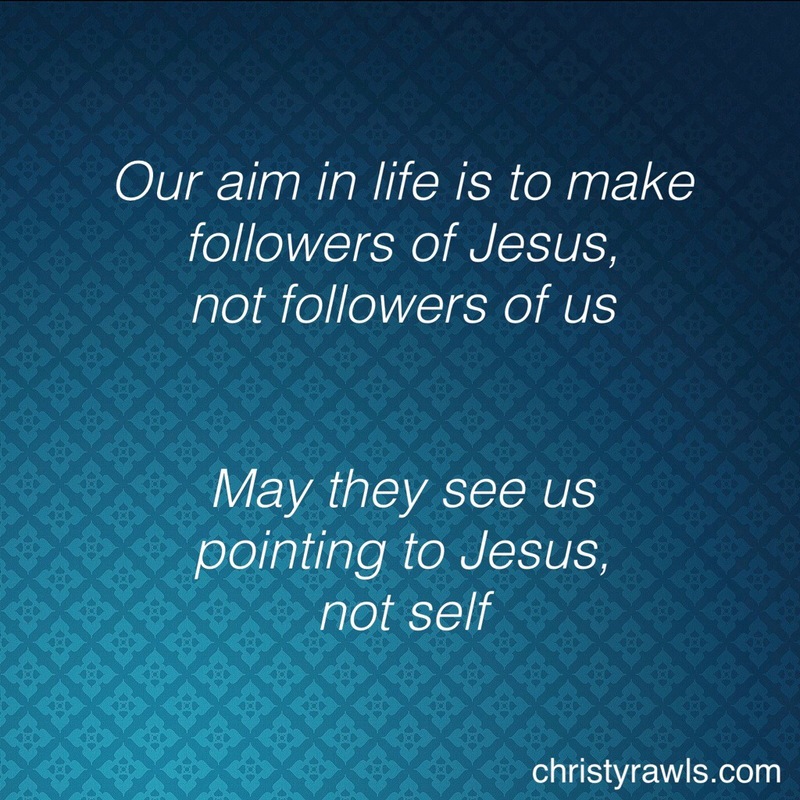 Our aim in life is to make followers of Jesus, not us. It’s a brand new day. It’s 10% of what happens to you and 90% of how you react to it. Decide that today is going to be different. The enemy doesn’t want us in God’s Word because he knows what a warrior we become when we read and follow it. So, that’s where we need to be every day. God has a blessing with your name on it. You always have a place to run to. Always. That place is God. So jump up! Rejoice! Grab a delicious meal of scripture and time with God! 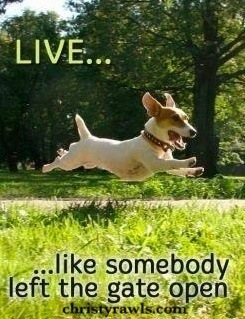 And live today like somebody left the gate open! Anyone who intends on coming along with Him has to let Him lead. We aren’t in the driver’s seat. He is. Don’t run from suffering but embrace it. Follow Him and He’ll show you how. You may have opposition of loved ones. Some of your family and friends may oppose what you stand for. The Message we proclaim isn’t popular. We will suffer in one way or another for righteousness sake whether that means saying no to a certain movie with our friends, or taking a stand before the world for what you believe in. Self help is no help at all. Self-sacrifice is the way, His way, to finding yourself – your true self. Do you think of your relationship with God primarily in terms of what’s in it for you or in terms of what you can do for Him? The tendency is to save our lives by selfish, complacent routine—basking in comfort, luxury, and ease by living for the present. Trading our finest talents in exchange for a few years of mock security. God calls us to a life of death to self and to the world. 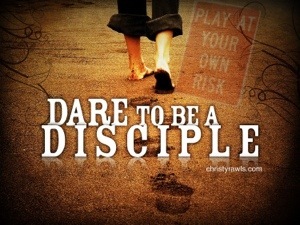 We are called to pour out our lives for the sake of others, not to spend our lives on earth merely to please ourselves. If anyone is embarrassed with Jesus and the way He leads us, know that He will be far more embarrassed of us when He arrives in all His splendor in company with the Father and the holy angels. Don’t back down. Stand up and stay up! Our instinct is to recoil from a life of cross-bearing. Our minds are reluctant to believe that this could be God’s will for us. 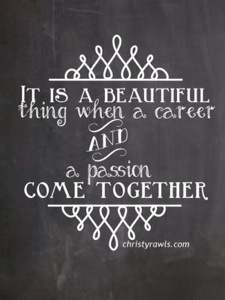 This life involves laying hold life that is life indeed! It means finding, at last, the reason for our existence! What joy and peace it is to be right where God wants you to be, doing exactly what He wants you to do! And, it means eternal reward. What a PROFOUND spiritual pleasure that comes! This life of abandonment has a deep inward satisfaction that defies description. Ever see someone go through things and remain in peace? This is why. Giving this up for anything this temporary world could offer would be an insane bargain. This is what we’re called to. This is the real you- the you that you were created to be. Anything less is said not to be a true disciple, but merely superficial lip service. True, it’s risky business following Jesus in this world, but the odds are in our favor. We win. 1. 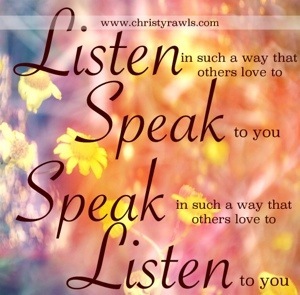 We must listen in such a way that others love to speak to us. How significant is listening? Listening is the fullness of hearing. It is possible to hear someone talk and not listen. In order to hear and listen, one must be paying attention. It’s so unnerving to talk to someone who isn’t listening. It quickly turns people off and turns them away. People love to talk to good listeners. James 1:19 in the NIV version says it this way: My dear brothers and sisters, take note of this: Everyone should be quick to listen, slow to speak and slow to become angry. Don’t make snap judgements. Don’t assume. First, listen well. The world is in need of a Savior and there is only One. We must carry the Gospel message out to the world. We must hear those who are asking for help, we must listen to them to give them what they need. You have the Source of help. Are you listening? 2. We must speak in such a way that others love to listen to us. Her words are wise, gentle, and dripping with love. Wise words (not a smart mouth), spoken and motivated by the greatest gift of all (Love) is exactly the way Christ teaches us. The best way to do that is through compassion. If we first place ourselves in their shoes for a moment and think of all the ways God is loving and patient with us, how could we be any less with others? After all, it is only by the grace of God that we aren’t struggling in their area……. or that we once were and are no more. God drove this truth home for me this week in a big way. Let’s word that in another way: God taught me a lesson this week. 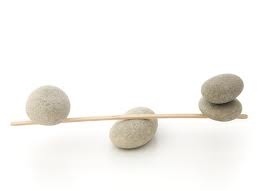 I was in the middle of several sticky situations and with some people who were dropping the ball in a big way. I was tempted to lose patience with them when I got that Holy tap on the shoulder that reminded me: God meets us ALL where we are. These people aren’t mature enough to handle this well, but they could be one day. Teach. Don’t preach. Once I walked that out, things ran more smoothly, and they walked away encouraged. She delights to talk of the Word of God and does so motivated by love: the greatest gift. She is careful in WHAT she says and HOW she says it. The influence God has gifted us with should always be one that praises God and builds up people for His Kingdom. POINTS TO PONDER: Influence is a gift. Am I faithful with my influence with those around me? Is my influence being used for HIS glory? Who am I being influenced by? Am I careful in what I say and how I say it…..when I say it, and to whom? Am I speaking words into people’s lives that are wise, gentle, and dripping with Love? Am I also doing this with my family? May we all listen in such a way that others love to speak to us, and speak in such a way that others love to listen to us. May we be an influence on all those around us as our Jesus is. Let’s make an impact for HIM. Let’s make much of Jesus. If there is one thing that is consistent throughout scripture, it is this: God calls people when they are not ready. God will never call you into service when you think you are ready. This is intentional on God’s part. 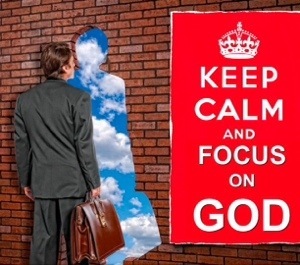 And, you can be sure when God calls you, you will have similar responses as Saul did when he was called to be the first king, or Gideon, when he was called to take down the idols in his nation, or Moses, when he was called to deliver his people from Egypt. Saul answered, “But am I not a Benjamite, from the smallest tribe of Israel, and is not my clan the least of all the clans of the tribe of Benjamin? Why do you say such a thing to me?” (1 Sam 9:21). “But Lord,” Gideon asked, “how can I save Israel? My clan is the weakest in Manasseh, and I am the least in my family” (Judg 6:15). But Moses said to God, “Who am I, that I should go to Pharaoh and bring the Israelites out of Egypt?” (Ex 3:11). When God calls, you will most likely be in the most unlikely circumstances to receive that call. You will be in the midst of a crisis, you will lack resources, you will not have the skills you think you need. This too is the way of God. 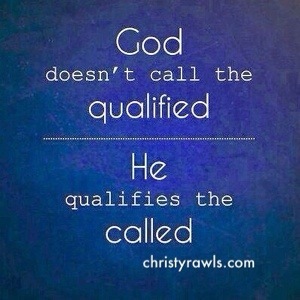 God does this because He wants you to know your call is only based on His ability, not yours. When you think it is based on you, this is a false humility. And, it is unbelief and disobedience on your part. Has God called you to something you have failed to do because you felt you were not ready? Repent before the Lord and let God accomplish great things through you. You are beloved of the most high GOD. The One True GOD. You are bought, paid for, redeemed, restored, re-done, repurposed, and worth it. He is crazy about you, mad about you, obsessed about you, His mind is stayed on you. You are beautiful. His eye is always in you. All heaven praises and celebrates you. If you falter, He will drop what He’s doing and come running for you. Everything He does is a solution for you. There is nothing you can do to make Him love you any less and there is nothing you can do to make Him love you any more. 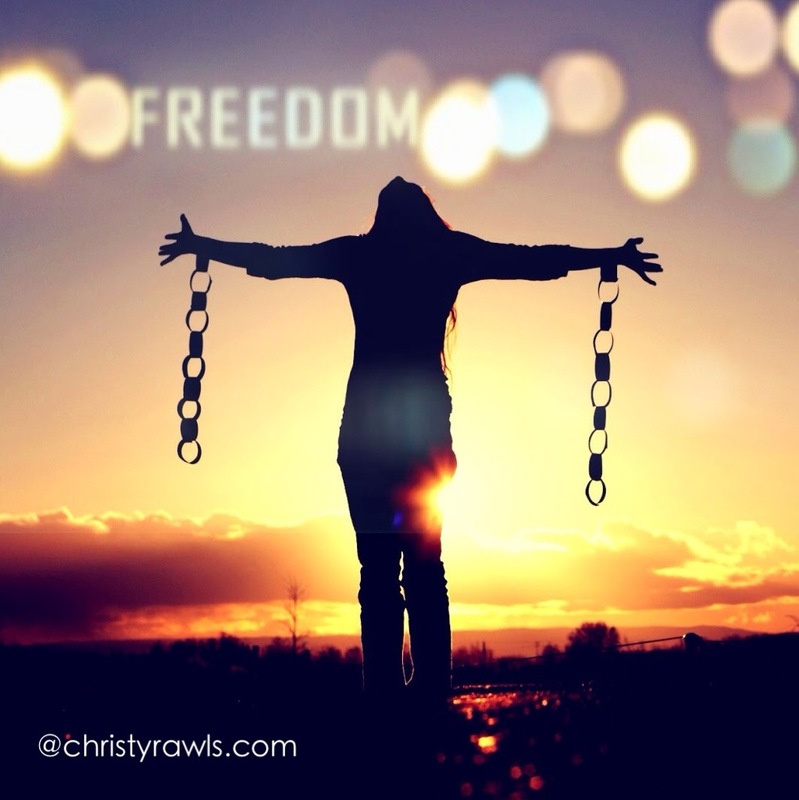 YOU.ARE.SET.FREE!! The Creator of the sun, moon, stars, day, night, land, air, sea, mountains, trees, seasons, and mankind has you in the palm of His hands. You are the apple of His eye. He created you in His image to reflect His love to this world. You, my friend, my sister, my brother, are His love song to this world. The Word That Became Flesh became you on that cross so that you could become Him in this world. 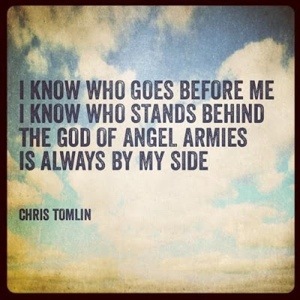 He is mighty, He is power and He calls you friend. 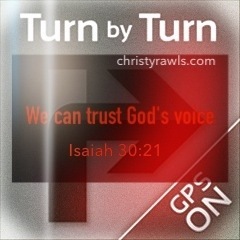 He goes before you, behind you, stands beside you, makes your paths straight, and directs you. He covers you, protects you, and shelters you. He spoke the world into existence, and the sound of your voice turns His head. He takes the unlikely and makes them the one. He takes the unqualified and gives them power and position. He takes the unworthy and gives them a crown. He takes the humble and gives them a seat of honor; love and acceptance to the unlovable. He takes the sick and makes them whole….hope to the hopeless. Trades sorrow for joy, pain for pleasure, fear for perfect peace. His burden is light. Hear that beat? Here that music thumping? Come on, get up! 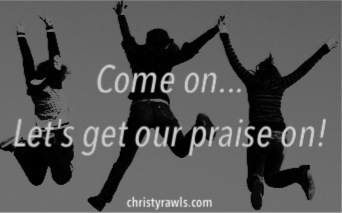 Let’s get our praise ON! Avodah (Ah´-voe-dah) is a Hebrew noun used in the Bible that has two distinct yet intertwined meanings: worship and work. It is also derived from the Hebrew verb L’Avod which has two meanings; to work and also to worship. The dual meaning offers powerful wisdom for modern times for how we are to view our work lives. Work, if done with and unto God, is a form of worship in the biblical Hebrew context. There has never been a concept of segmenting our work from our faith life in the Bible. It is in the realm of the sacred to bring God into our everyday life. Hebrews did not set aside a “day of worship,” such as Saturday or Sunday, but everyday is a place and time of worship. They did set aside a Sabbath day of rest. It is a western idea to segment one’s faith life from our work like. In the Middle East and Asia, their cultures would never separate their faith from their work life even though their faith foundations might clearly contradict Christian beliefs. When someone comes to faith in Christ from this area of the world, they have an easier time of assimilating their faith into their work because they have always done so. God calls us to do our work as an act of worship to Him. 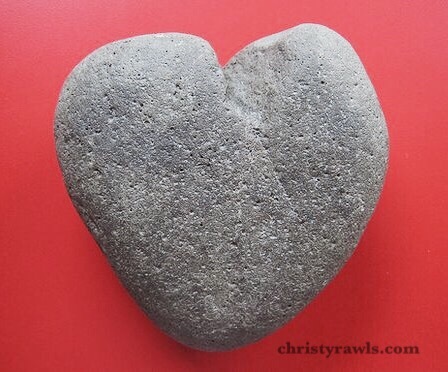 Our work is not to be a place of sweat and toil, but an expression of our love, faith and adoration of Jesus Christ. Today, before you work, ask God to help you see your work in a new way–as worship to Him. The book of Genesis begins with “God created the heavens and the earth” The world—and you—are not products of blind chance and probability; God created it and us. They are here. We are here. God created all that we see and experience. Here we begin the most exciting and fulfilling journey imaginable. God did not NEED to create the universe. He CHOSE to create it. Why? Love. God is love and love is best expressed toward something or someone else. So, God created the world and people as an expression of His love. We can know in a very personal way this God who created the universe. God’s deepest desire is to relate to you. To have fellowship with you, His creation. He took the ultimate first step in this relationship with us through His visit to this planet in the person of His Son, Jesus. Now, it’s your turn. It’s your move. How do you grow closer to understanding and hearing from God? By giving heed to His gentle checks, His delicate restraints and constraints. His voice is still and small and must be felt. God is love and His voice is for the ear of love. And, your love should be intent on hearing even the smallest of whispers. 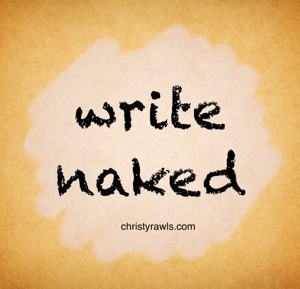 You know…those times in conversation when you’re just about to say a word, and you feel that gentle nudge. And, those moments when you’re about to pursue something that seems clear and right and there comes a quiet suggestion that another way is better. It’s a voice quietly spoken in your heart at first but the more you listen and obey, it grows louder and clearer. If you want to know Him better take heed to His voice even when is seems contradictory from a human standpoint. Obey even when He asks you to move in the dark. When you do, you will experience a fellowship with God that is wildly overpowering, wonderfully overwhelming, and more than you could ever imagine. A relationship that will hold you and He closely together even in the most severe testings and pressures. Remember: You are part of creation, and He is pleased with how He made you. If at times you feel worthless, remember that God made you for a good reason. You.Are.Valuable.To.Him. 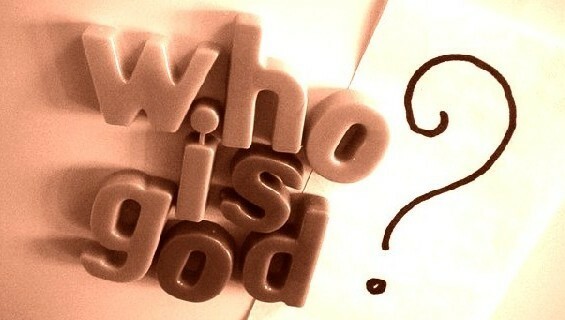 Tagged Bible, Book of Genesis, Book of Isaiah, Christ, Christianity, Epistle to the Ephesians, fellowship with God, Genesis, God, God's love, God's voice, Hear God's Voice, Jesus, Life, purpose, relationship with God, who am I, why am I here? Scripture gives perspective. The Word builds fruit in our lives. We sometimes look “at” scripture but not “through” scripture. 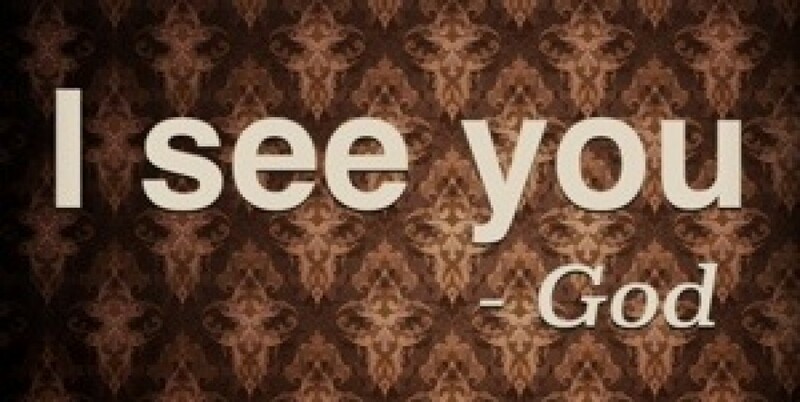 Go through your day by looking at it “through” the scriptures. Because He told you this morning in His Word that He loves you and goes before you, gives you wisdom, has good plans for you, you will respond to things rather than react to things. 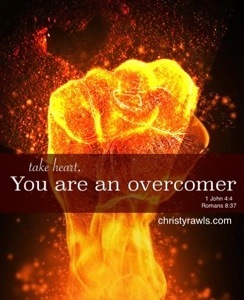 Live out your day on those promises fearlessly when things come your way, knowing that He meant what He said. We can walk through things boldly and confident in Christ when we see every event, change, or situation through His promises. Therefore, if anyone is in Christ, he is a new creation; old things have passed away; behold, all things have become new (2 Corinthians 5:17). I love Spring. It gets me excited. It makes me stretch all the cold bones of the winter and washes away all the mud and the muck. All those dreary days are forgotten at the sight of that first Spring flower. And my eyes dance. I love the newness.That freshness of all things beginning. Growth. Potential. Everything on the horizon. When you ask Christ to be your Savior, you are a new creation. Your sins are forgiven. All things new. Satan always defines your life based on your past; God defines you by your future. Perhaps you’ve heard such words. 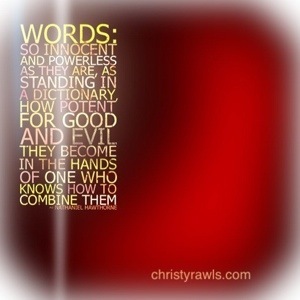 Words can define us if we let them. Failure can be a warning sign that motivates change or it sends us into self-sabotage and shame. The cross paid the price for that. Have you accepted the payment on your behalf? When you allow others to define who you are that is contrary to who God says who you are, you’ve made them an idol in your life. You’ve allowed a spirit of rejection and shame and performance to define you. When we come to know Christ our spirit is 100% redeemed. However, our soul requires regeneration. This is a process. The Bible calls it sanctification. “Now may the God of peace who brought up our Lord Jesus from the dead, that great Shepherd of the sheep, through the blood of the everlasting covenant, make you complete in every good work to do His will, working in you what is well pleasing in His sight, through Jesus Christ, to whom be glory forever and ever. Amen” (Hebrews 13:20-21). It is God’s responsibility to guide our maturity process as we yield ourselves to Him. You are a new creation “in process.” Only Jesus made plan “A” in His life. 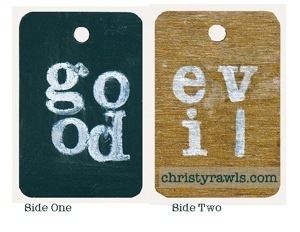 God redeems our “B” and “C” plans to be His “A” plan. Accept God’s process in yourself and in others. Believe who Daddy says you are.